I must be crazy. I bought a whole chicken today and I'm one person. 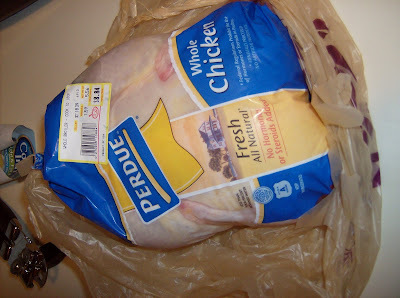 A few days ago, I was reading this post on saving money by cooking a whole chicken and then browsing through the circular for my grocery store, I saw that they were on sale and I thought why not? I called my mom to ask her how I should do this and she started telling me about removing the stuff inside the chicken. eww. I'm not crazy about sticking my hand in a chicken and removing whatever is in there. Gross. But for some reason unbeknown to me, I still bought one. The woman at the store, whom I also consulted, offered to do it for me but I thought (stupidly), "I'm a big girl, I can do this" and said, "no" (again, stupidly). Now there is a chicken in my fridge. I'm planning to make the chicken tomorrow because I have the day off (Columbus Day). I'm going to have it for dinner and portion the rest out into containers to put in the fridge to use later. I'll let you know what happens.